The Nexus Q was a bit of an embarrassment for Google, and quickly disappeared into the ether. But a new FCC application, which has been leaked online, could mean the media streaming device is about to make a return. The mystery project has been named the "H840" with a product name "H2G2 – 24", which seems to be a Hitchhiker's Guide To The Galaxy reference. Little other information appears on the FCC application image other than the matter-of-fact description - "the device functions as a media player". It also offers Wi-Fi connectivity and hosts a USB port. 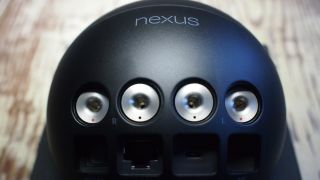 The Nexus Q, which was unveiled at Google's I/O last year, sold out quickly on the Play store but it was soon removed by Google, which felt it could offer a better device. Those who received the device were never actually charged and it appears that the new version of Google Play Music does not support it. It's worth noting that the device is mains powered, which means it's not mobile and therefore more than likely a revamped Nexus Q...or something we haven't even thought of yet.